"All American made" Each one of these extremely fine condition real 5 Mark (a little smaller then a U.S. half dollar) silver coins from Germany is first layered in pure "Bright Silver". Then the figures of each are highlighted and brought to life with rich pure 24K Gold & Pure Silver (this gold & Silver work is done by hand). This breathtaking and exclusive work turns these coins into stunning and true works of art. Each coin is hermetically sealed "against wear" in clear, hard acrylic coating. 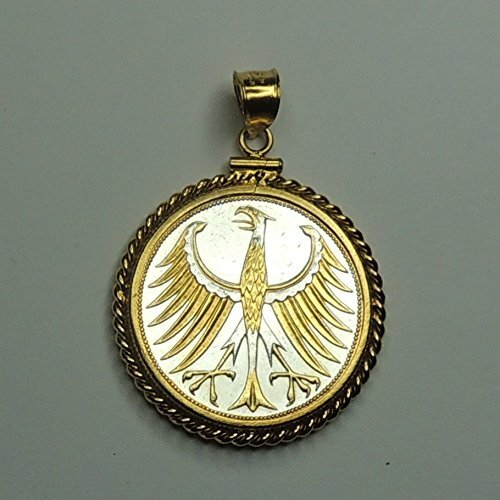 Each coin comes mounted in a beautiful gold filled rope bezel. And ready to put on your chain. Your pendant purchase also comes in a special presentation box for self purchase or as a special gift for him or her. The gold on the coin is real 24k, not paint. If you have any questions about this product by J&J Coin Jewelry, contact us by completing and submitting the form below. If you are looking for a specif part number, please include it with your message.